With a bitter cold winter, it's not uncommon to find your door lock has frozen and you're unable to get your key in the lock. Frozen doors are really frustrating, especially when you're stood yourself out in the cold wanting to get in out of the cold. Don't try and force your key into the lock with too much force, you may break your key, and if you do manage to get your key in the lock and cannot turn the key, again don't apply too much force, as you could break your key in the lock and then it's not only a new key, but a new lock barrel aswell! Hand Sanitizer - These contain alcohol which can melt the ice. Put some of the sanitizer on the lock and on the key and gently wiggle the key in and out of the lock to loosen it up. Cigarette Lighter - Warm up your key carefully with the lighter (portable or car lighter) and again wiggle the key gently in and out of the lock to thaw it out and gain entry. WARNING - proceed with care if you use a naked flame lighter after trying sanitizer! De-icer - If you've just driven home, there's a good chance you have de-icer in your car for the winter. Spray this on the lock, wait a while, spray the key, and again wiggle in and out gently until the lock loosens. Hair dryer - If you're at home and trying to gain entry to your car and have an extension lead, heat the lock with a hair dryer. 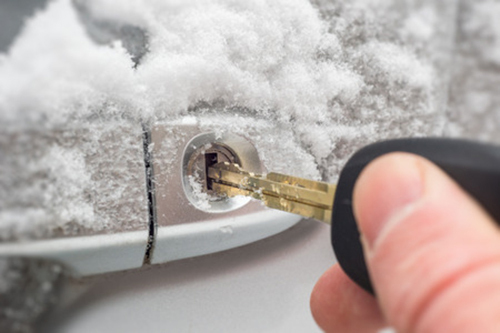 Your hands - Heat your key in your hands or put your thumb on the lock for a short while, this could thaw the lock enough to get your key in. A good way to help prevent your locks from freezing is to put graphite powder into your lock, this is suitable for all types of locks, from padlocks to car doors and your front door and costs around £5 for 50g. This can be a bit messy, but applied carefully this can really help prevent your locks from freezing in icy cold conditions.